The sturgeon family, Acipenseridae, is characterized by five rows of bony scutes or plates on the body, rather than scales; four barbels that precede the inferior and protrusible mouth; the absence of teeth in adults; a large swim bladder; fewer than 50 gill rakers; and pectoral fins with anterior spinous ray made up of fused rays (Nelson 2006). They also have a flattened rostra and elongated upper tail lobes. Collectively, the Acipenseridae family is also known as the true sturgeons. Members of the Acipenseridae differ from the paddlefish family Polyodontidae in that the latter have a paddlelike snout with minute barbels, the presence of minute teeth, and lack the large scutes of the acipenserids but have small "scales" in some regions; in some cases, paddlefish also have long gill rakers, including hundreds of gill rakers in the plankton-feeding Polyodon (Nelson 2006). Caviar is a luxury food, consisting of processed, salted, non-fertilized roe (ripe egg masses obtained from fish). Traditionally, the term caviar referred only to roe from wild sturgeon in the Caspian and Black Seas (Davidson and Jaine 2006. According to the United Nations' Food and Agriculture Organization, roe from any fish not belonging to the Acipenseriformes species (including Acipenseridae, or sturgeon stricto sensu, and Polyodontidae or paddlefish) are not caviar, but "substitutes of caviar" (Catarci 2004). This position is also adopted by the Convention on International Trade in Endangered Species of Wild Fauna and Flora (CITES 2002). However, depending on the country, the term caviar has also been applied to describe the roe of other fish, such as salmon, steelhead, trout, lumpfish, and whitefish. The rarest and costliest is from beluga sturgeon that swim in the Caspian Sea. ↑ R. Froese and D. Pauly, eds., Acipenseridae, Fishbase (2009). Retrieved August 15, 2012. Anderson, R. 2002. 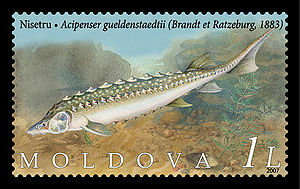 Shortnose sturgeon: Acipenser brevirostrum. Canadian Biodiversity Project. Retrieved August 15, 2012. Bemis, W. E., E. K. Findeis, and L. Grande. 1997. An overview of Acipenseriformes. Environmental Biology of Fishes 48:25–71. Berg, L. S. 1962. Freshwater Fishes of the U.S.S.R. and Adjacent Countries, vol. 1, 4th edition. Jerusalem: Israel Program for Scientific Translations Ltd. (Russian version published 1948). Burtzev, L. A. 1999. The history of global sturgeon aquaculture. Journal of Applied Ichthyology 15(4-5): 325–325. Carocci, F., C. Lagrange, V. Levavasseur, and A. Yakimushkin. 2004. Sturgeons (Acipenseriformes). In World Markets and Industry of Selected Commercially-Exploited Aquatic Species With an International Conservation Profile, FAO Fisheries Circulars - C990, FAO Corporate Document Repository, Fisheries and Aquaculture Department. Retrieved August 15, 2012. Retrieved August 15, 2012. CITES. 2002. 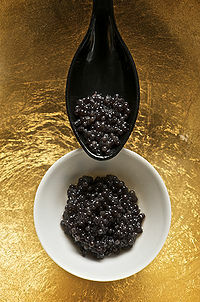 Caviar: Processed Roe of Acipenseriformes Species. Annex 1 - CITES Guidelines for a Universal Labeling System for the Trade in and Identification of Caviar. In Resolution Conf. 12.7 - Conservation of and Trade in Sturgeons and Paddlefish, Twelfth Meeting of the Conference of the Parties, Santiago (Chile), 3-15 November 2002. Davidson, A. and T. Jaine. 2006. The Oxford Companion to Food. Oxford University Press. ISBN 0192806815. ISBN 9780192806819. Duke, S., P. Anders, G. Ennis, R. Hallock, J. Hammond, S. Ireland, J. Laufle, R. Lauzier, L. Lockhard, B. Marotz, V. L. Paragamian, and R. Westerhof. 1999. Recovery plan for Kootenai River white sturgeon (Acipenser transmontanus). Journal of Applied Ichthyology 15(4-5): 157–163. Fontana, F., J. Tagliavini, and L. Congiu. 2001. Sturgeon genetics and cytogenetics: recent advancements and perspectives. Genetica 111: 359–373. Frimodt, C. 1995. Illustrated Multilingual Guide to the World's Commercial Coldwater Fish. Oxford, England: Fishing News Books, Osney Mead. OCLC 4669435183. Gardiner, B. G. 1984. Sturgeons as living fossils. Pages 148–152 in N. Eldredge and S. M. Stanley, eds. Living fossils. New York: Springer-Verlag. ISBN 0387909575. Krieger, J. and P. A. Fuerst. 2002. Evidence for a slowed rate of molecular evolution in the Order Acipenseriformes. Molecular Biology and Evolution 19:891-897. Krykhtin, M. L., and V. G. Svirskii. 1997. Endemic sturgeons of the Amur River: Kaluga, Huso dauricus, and Amur sturgeon, Acipenser schrenckii. Environ. Biol. Fish. 48(1/4):231-239.
International Union for Conservation of Nature (IUCN). 2010. 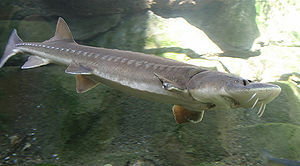 Sturgeon more critically endangered than any other group of species. IUCN. Retrieved August 12, 2012. Luna, S. M., and A. G. Torres. 2012. Huso huso (Linnaeus, 1758), Beluga. Fishbase. Retrieved on August 12, 2012. Lupovich, H. 2010. Jews and Judaism in World History. New York: Routledge ISBN 0203861973. Ruban, G. I. 1999. The Siberian Sturgeon Acipenser baerii Brandt: Structure and Ecology of the Species. Moscow: GEOS. 235 pp (in Russian). Wood, G. L. 1982. The Guinness Book of Animal Facts and Feats. Enfield, Middlesex: Guinness Superlatives. ISBN 9780851122359. Zolotukhin, S. F., and N. F. Kaplanova. 2007. Injuries of Salmon in the Amur River and its Estuary as an Index of the Adult Fish Mortality in the Period of Sea Migrations. NPAFC Technical Report No. 4.